Royal Bank of Scotland (RBS) has warned it expects to write off about £1.25bn because of its exposure to bad debts in the US sub-prime loans market. About £300m of the loss relates to the exposure to the US of Dutch bank ABN Amro, which it bought in October. 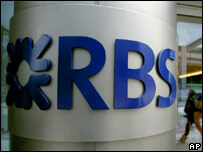 But the hit is less than many had expected and RBS said its 2007 profits would beat analysts' forecasts. Rising mortgage defaults and falling US house prices have meant loans bought by banks are worth less than thought. The bank's chief executive Fred Goodwin said that the write-downs were based on what RBS thought its total losses would be. There would only be further losses if the situation "got materially worse from where it is now", he added. In a trading update, the UK's second largest bank, said that it faced a £250m impairment charge on loans made to private-equity buyouts. But RBS said it had been able to offset this by drawing on cash reserves rather than being forced to borrow from the more expensive wholesale credit market. BBC business editor Robert Peston said the bank's losses were "not nice, but a long way from lethal". "Only a few years ago - before a takeover spree - damage on that scale would have killed RBS," he said. "Today it means that RBS's pre-tax profits for 2007 will be a fraction under £10.5bn, a new record." RBS also revealed that deposits had grown rapidly in the second half of the year as savers abandoned the stricken bank Northern Rock and looked to put their money elsewhere. The BBC's Mr Peston said that about £800m of extra cash had been put into RBS accounts in recent months. "At a time when the rates charged by banks for lending to each other is hitting record levels, this inflow of deposits represents cheap money," he said. RBS added that its integration with ABN since its 71bn-euro ($98.5bn; £49bn) takeover was "progressing well" and that the benefits were set to be "somewhat greater than anticipated". The deal, completed in October after a bidding war with Barclays, was Europe's biggest banking takeover to date. And it said that while growth at its investment bank arm had slowed, it was set to report good profit growth for 2007. Analyst Keith Bowman of Hargreaves Lansdown Stockbrokers said that RBS had answered concerns about its position "with some style". "Whilst some lingering concerns will remain, with the full impact of the current credit crunch still yet fully quantified, the statement should greatly restore investor confidence," he said. RBS shares closed up nearly 3% at 478.5p, having risen as much as 8% at one point.